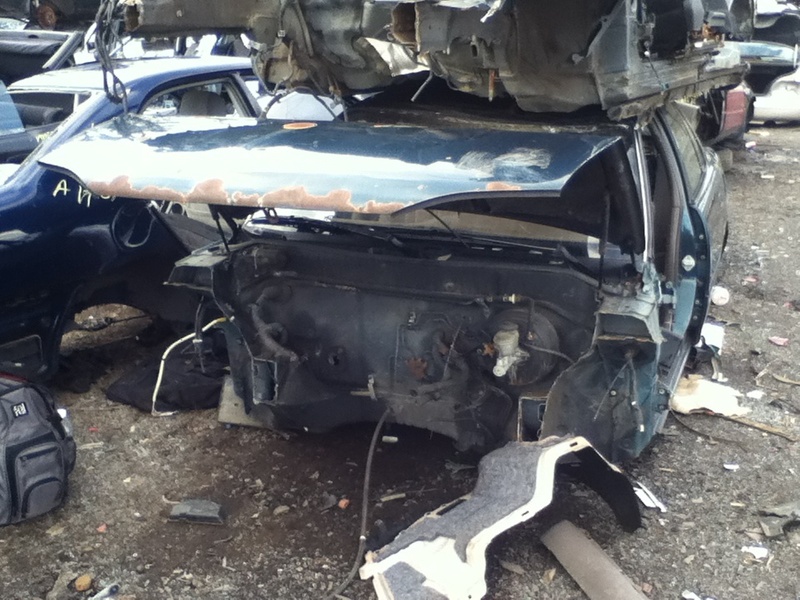 Firstly, let me say that junkyards are exactly as cool as you might expect. There were literally piles of cars to pick through organized by brand. I moseyed over to the Toyota section and set to work. The first thing I did was grab a bunch of those connectors that I was looking to buy. They were the easiest part to extract, so I figured I’d grab a few. 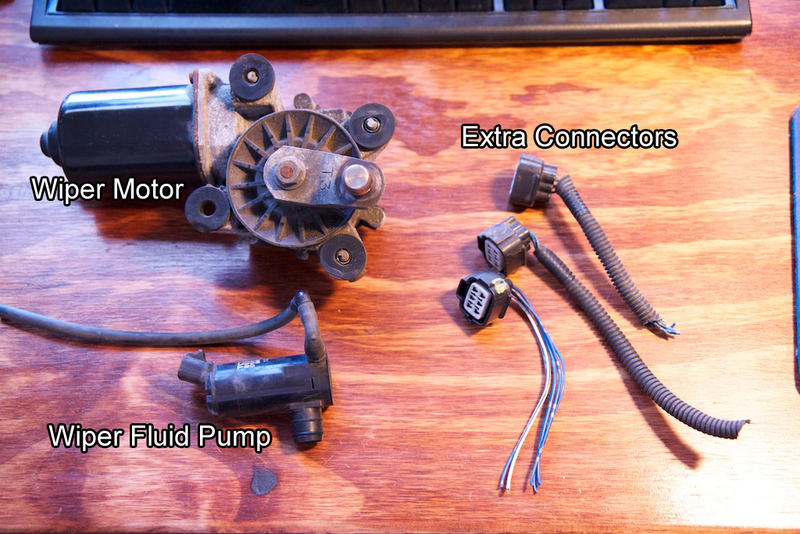 I also grabbed a wiper fluid pump because mine broke like six years ago. I’m not sure if it’s compatible with my car, but I can’t imagine there are too many different types of wiper fluid pump in a single car brand. Lastly, I wanted to grab a wiper motor. The one in my car works fine, but I thought it would be convenient if I could use the motor inside during development rather than having to do all my coding outside in the cold. 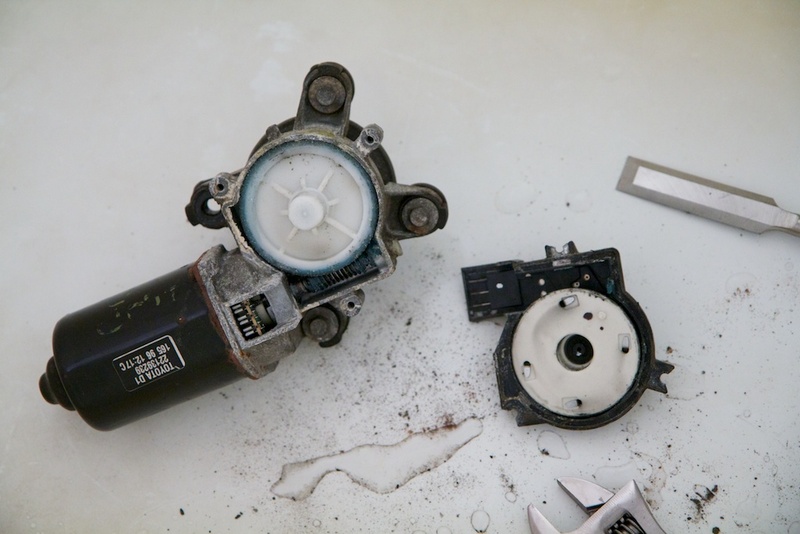 Extracting a wiper motor isn’t super easy. It also doesn’t help when the bolts are likely to be rusted and you don’t own a socket set. The real issue is maneuvering whatever tool you’re using around all of the engine parts. “Where is the engine?” you might ask? Probably in a number of places. When I got the motor home, I was excited to see that it worked! I was less excited to see all the caked up grease, rust, and dirt falling off the motor every time I touched it or turned it on. 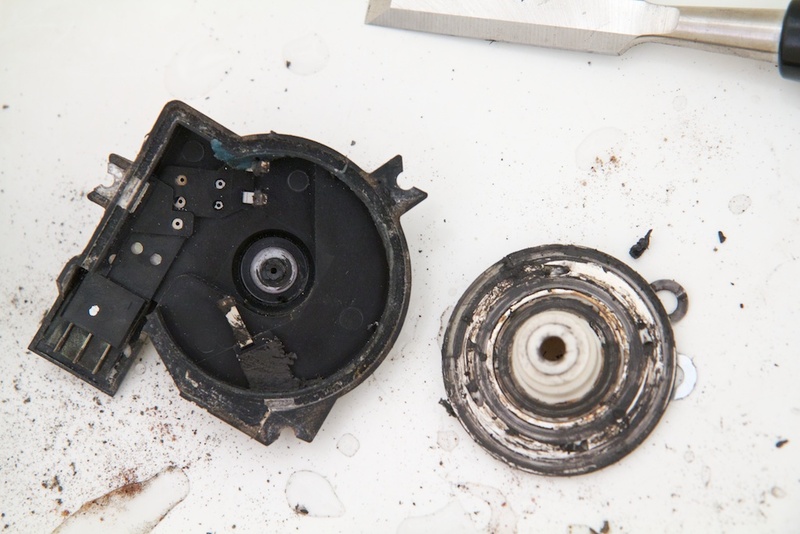 I suspected this dirt was partly responsible for the spurious data I was getting from the parking switch contacts. They started out working fine, but after a few hours of testing, I had some really gross looking waveforms coming out. There was also a squeaking sound that got louder as time wore on. After years of sitting immobile, a lot of grime had settled that I was suddenly stirring up. That right section houses the contact brushes and disk. 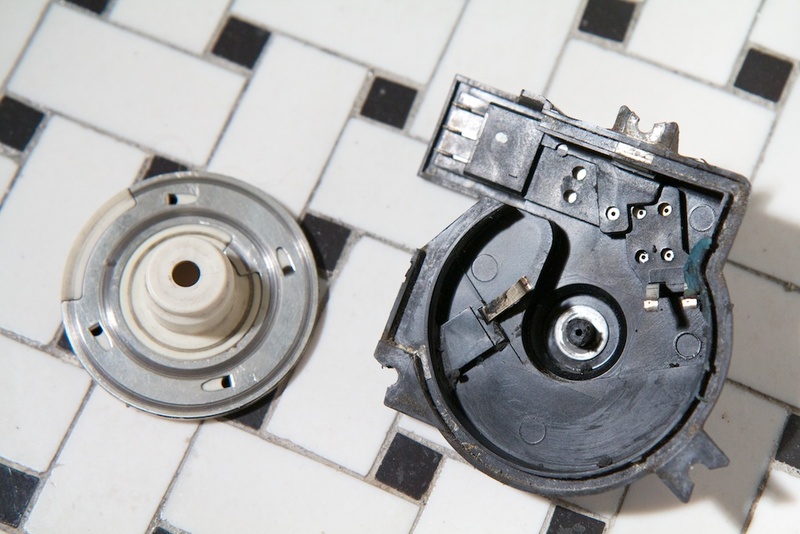 The plastic part you see has a small plastic nub that hooks on to the rotating section opposing it. It wasn’t super easy to get access to the disk. Instead of a bolt holding it down, there was some kind of plastic harpoon-tip style piece that looked like it wasn’t intended to ever be removed. This tip isn’t needed when both halves are assembled though; everything is held together pretty tightly by the outside housing. I figured it was safe to remove the tip by boring it out with a drill. No wonder I was having problems. That’s a pretty gross disk. Using some dish soap, an old tooth brush, and some elbow grease, I think I cleaned things up pretty nicely. I took some of the clean grease that never really got spread out properly (the blue blob on the top right) and applied it evenly to the metal disk to prevent the now-clean contacts from wearing out. After slapping it all back together, I found that not only are the contacts a lot cleaner, but it also stopped squeaking! I’ve made some very rapid progress programming with the help of this motor, but it’s getting late, so I’ll have to clue you in on my new code in another post. 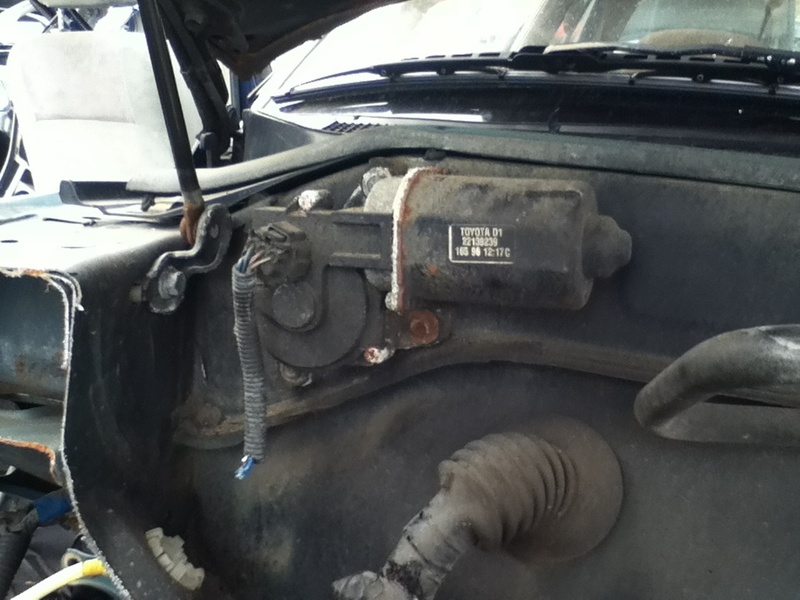 This entry was posted in Beat Tracking Windshield Wipers and tagged motors, power electronics by ch00f. Bookmark the permalink.